My first taste revealed a juicy and somewhat soft fruit with a whisper of sweetness. Its mildly earthy and tame flavor reminded me a bit of jicama (though it’s not nearly as crunchy). With this blank canvas potential and my vision of ice cream nearby, a frozen dessert was my dragon fruit’s destiny. I wanted to add a delicate flavor that wouldn’t hide the fruit’s character, and fragrant lemongrass soon came to mind. I began by steeping it in a syrup made from light coconut milk, which proved to hold the herbal flavor much better than a water-based version. 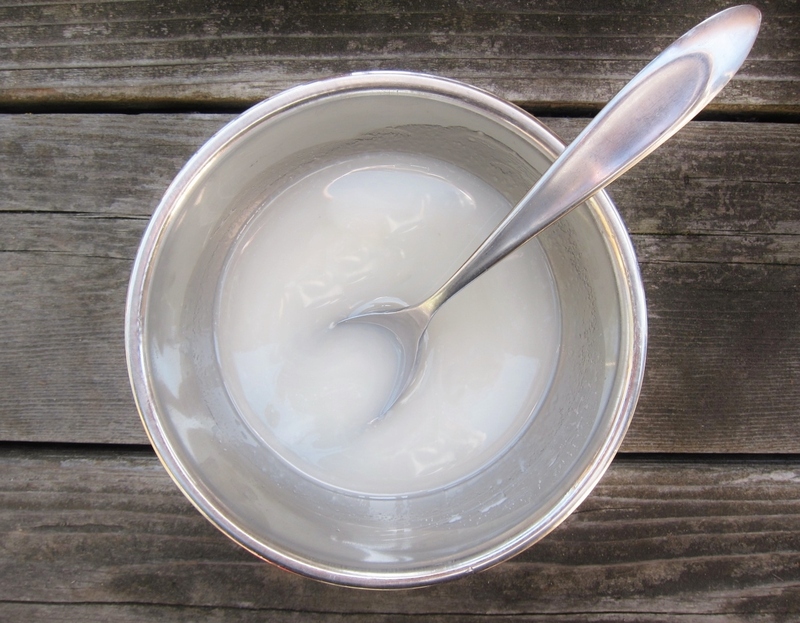 The light milk also offered a faint, creamy quality and the promise of not freezing solid (as its full-fat counterpart would do). Together with the dragon fruit, the velvety lemongrass syrup made for a luscious harmony of flavors. For complement and contrast, I added a few tangy strawberries — but when I blended them in with the dragon fruit, their flavor and color were overpowering. So I made a simple layer of puree to top the sherbet, starting with a good soak in liquor to avoid iciness once frozen. The result is a berry shell that’s just a bit firmer than the sherbet beneath, adding a scrumptious balance to the creamier, more delicate layer. As a bonus, the finale is a nod to the fruit that inspired it: vivid pink outside with a black and white interior. Incredibly addictive, this sherbet offers a celebration of refreshing and complementary flavor in every spoonful. The cool dragon fruit is faintly milky, citrusy and herbal with its gentle infusion of lemongrass. Meanwhile, the strawberry layer offers a hint of tartness and a welcome trace of classic berry sweetness. I’m ready for many a rendezvous with my new frozen dessert, just in time for summer. Join me? Like many frozen dessert recipes, this one requires some lead time for chilling and freezing, though the steps are all quite easy. I like to start 24 hours ahead of serving time, beginning with making the syrup and prepping the strawberries. Once the syrup, berries, and dragon fruit are fully chilled, the blending and churning are painless, and a final stint in the freezer is all that’s needed. 2.25 to 2.5 pounds dragon fruit (about 3 medium dragon fruit), chilled. Use a rolling pin or meat tenderizer to gently crush the lemongrass stalks. Then use a sharp knife to cut bruised stalks crosswise into rings about ½ inch wide. Place cut lemongrass in a small saucepan. Top with the light coconut milk, sugar and salt. Stir gently and occasionally as you bring to a boil. When near boiling, test a drop of syrup on a plate, let cool for a few seconds, then rub with fingers to ensure sugar is no longer grainy. As soon as syrup has come to a solid boil, remove from heat. Cover pan with lid and let steep for 15 minutes. Strain syrup into a heatproof bowl; discard cooked lemongrass pieces. Let syrup cool in bowl to room temperature, then cover and refrigerate until thoroughly chilled – at least a few hours or overnight. You should have about 1.25 cups syrup, which will become milkier as it chills. Place dragon fruit in the fridge to chill. Rinse and dry the strawberries, then hull them and cut into quarters or halves if small. Place in a bowl and toss with sugar and alcohol. Stir well. Cover and chill strawberries for several hours or overnight, until quite cold to the touch and fully soaked with the sugary alcohol. When syrup, berries, and dragon fruit are thoroughly chilled and you’re ready to make the sherbet, halve the dragon fruit and scoop out the flesh over a scale. You need 1.5 pounds (about 3 cups) dragon fruit flesh for the sherbet. Enjoy any extra dragon fruit as you wish, and discard the skins. 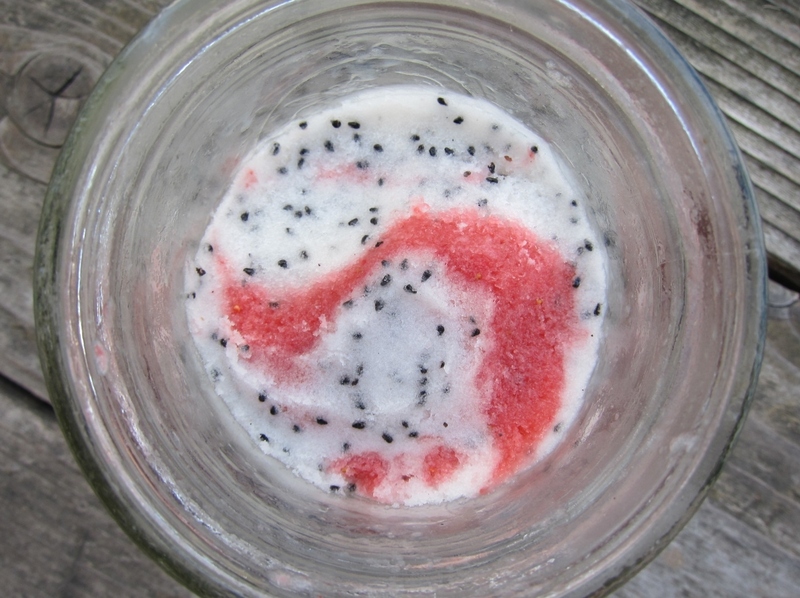 Place the dragon fruit flesh in the bowl of a food processor with ¾ cup of the lemongrass syrup. Pulse until smooth with no chunks of fruit. Transfer mixture into an ice cream maker and follow manufacturer directions, churning until consistency is at least as thick as soft-serve. Meanwhile, strain the cut strawberries (discard the boozy liquid or save it for a cocktail). Place strained strawberries in the bowl of the food processor with ¼ cup lemongrass syrup; use any remaining syrup as you wish. Puree until smooth. 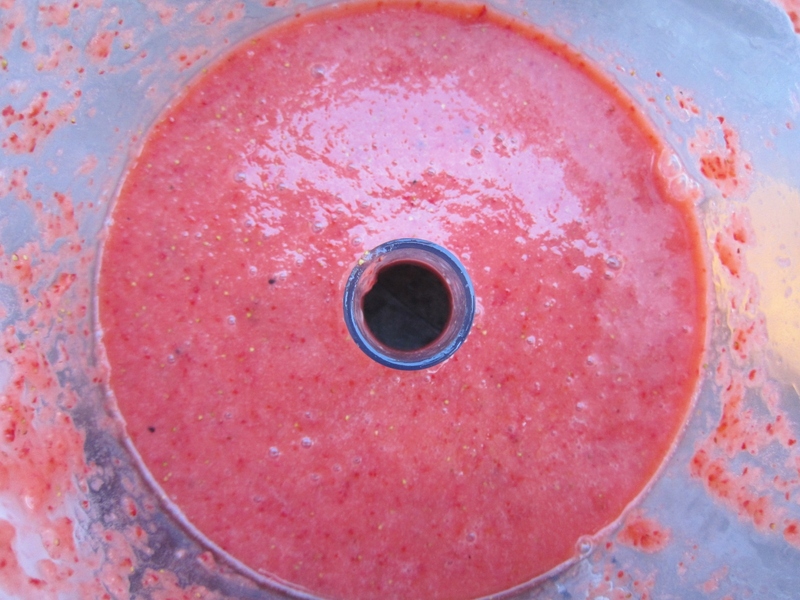 Chill strawberry puree until dragon fruit mixture is at soft serve consistency. Spread dragon fruit sherbet into an 8” cake pan. Pour strawberry puree over the top, gently spreading to edges. Cover tightly and freeze for several hours or overnight, until frozen through the center. When ready to serve, uncover pan and set out at room temperature for 5 minutes, then scoop. Store in freezer tightly covered up to a week. Maybe next time… The dragon fruit sherbet is quite delicious alone; the strawberry part is certainly optional. If you skip the strawberry layer, you could simply serve the dragon fruit sherbet with fresh ripe strawberries (or other berries); just remember that the recipe will yield a bit less than noted above. Feel free to play with the way you lay out the dessert; you can gently make layers of white and pink before freezing, use a loaf pan instead of round, or even make individual servings in mason jars or other containers. This entry was posted in Baking with Herbs, Sweets, Traditional with a Twist and tagged coconut, coconut milk, dragon fruit, dragonfruit, frozen dessert, lemongrass, sherbet, sorbet, strawberries, strawberry, vegan. Bookmark the permalink. Such a beautiful and refreshing looking dessert. I’ve never had a dragonfruit before – it sure has a lovely color. Looks delicious!